An elderly female driver of a green 1997 Buick Park Avenue lost control of her vehicle at the intersection of East Elm and Deerfield streets in Union City, making contact with and bringing down a utility pole before coming to rest in the parking lot of Sutton’s. The car collided with a business sign, a trailer display and an occupied silver 2014 Ford Escape before coming to a stop. UNION CITY – An elderly woman was transported to Wayne Healthcare after losing control of her vehicle. Union City Fire and Rescue and officers from the Union City Police Department were dispatched to the area in front of Sutton’s grocery store in regards to an injury accident. Arriving crews found an elderly female driver of a green 1997 Buick Park Avenue had lost control of her vehicle at the intersection of East Elm and Deerfield streets, making contact with and bringing down a utility pole before coming to rest in the parking lot of Sutton’s. 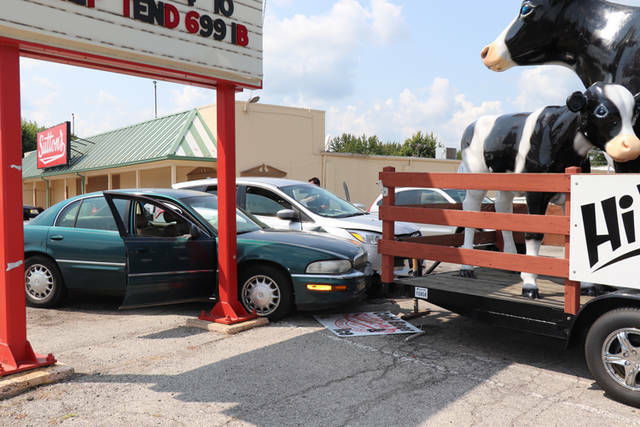 The elderly driver of the Buick, who was traveling eastbound on East Elm Street, collided with a business sign, a trailer display and an occupied silver 2014 Ford Escape before coming to a stop. The driver and lone occupant of the Buick was treated by Union City Rescue and transported to Wayne Healthcare for minor injuries. The driver and lone occupant of the Escape was uninjured. The accident remains under investigation by the Union City Police Department. This entry was tagged crash, Union City, Union City Fire and Rescue, Union City Police Department, Wayne HealthCare. Bookmark the permalink.